This year’s Veterans’ Day post will concentrate on only one of the many Georgia photographers who served their country in war. Many served on both sides during the Civil War, and others participated in the Spanish-American War and in the First and Second World Wars, but I only know of one who served as an aerial photographer during that profession’s infancy. 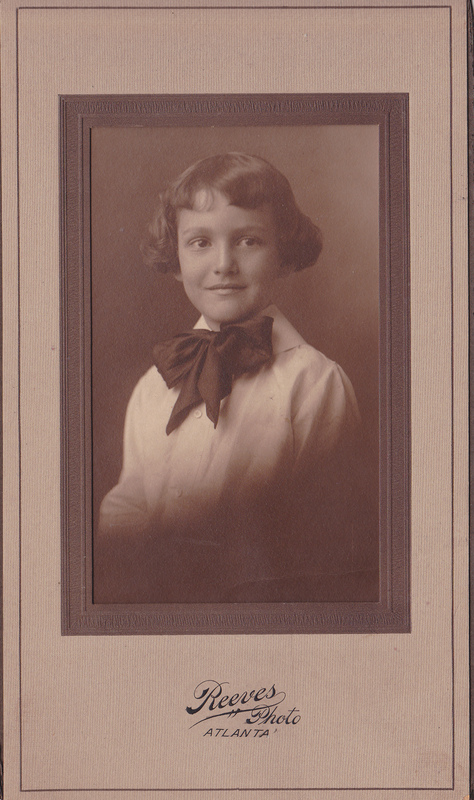 C. W. (Charles Walton) Reeves (1892-1989), was the only son of Atlanta photographer Walter R. Reeves (1866-1931). 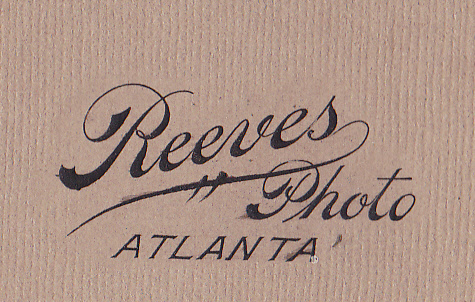 Formerly a photographer in Tennessee, W.R. Reeves began working in Atlanta by 1906, and in 1906 and 1907 he was a photographic printer for established photographers Edwards & Son, and for W. M. Edwards, photographer. Prior to going to work in the photo studio with his father, C.W. Reeves worked as a clerk for Bradstreet Co. and then for the Georgian newspaper. By 1914 father and son were working together, first under Reeves Photographer/s, then under C.W. 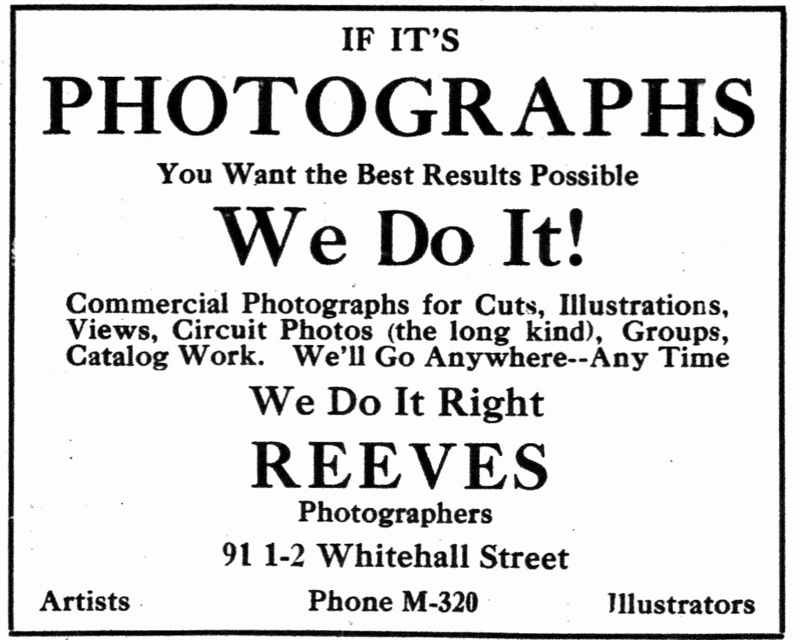 & W.R. Reeves, but commonly known as Reeves Photographers, and finally as Reeves Studio. After his father’s death, C.W. Reeves incorporated and the studio became Reeves Studios, Inc. After 1941 it was listed only as Reeves Studio again, and continued in business under that name for over forty years. Prior to 1918 C.W. Reeves had, in addition to working with his father, worked as a photographer for the Atlanta Constitution and for Atlanta’s “Auto Row.” For a few years he also ran a branch of the Reeves studio in Macon, Georgia. From 1914 to 1917 there was a Reeves Studio at 177 Cotton Ave. and he ran it for at least the first two years, but by summer of 1917 he was apparently back in Atlanta, and his aunt, Beulah Manlove, who had been working as a retoucher with her brother’s studio in Atlanta, took over. 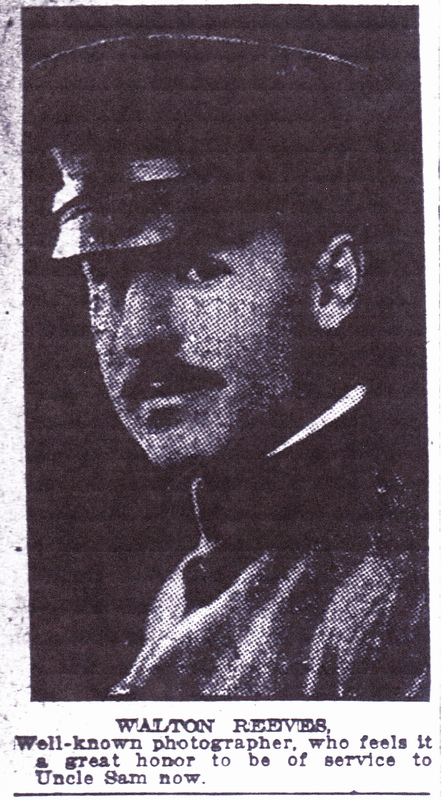 On December 1, 1918, C. Walton Reeves enlisted in the United States Army and became a part of the 3rd Photo Section, A.E.F. 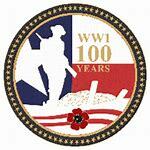 (American Expeditionary Forces). A letter he wrote to the Constitution’s automobile editor was reprinted in that newspaper on April 7, 1918. It was entitled “Atlanta Photographer, Friend of Auto Row, Writes Editor He’s on His Way to France” . …the honor of being in one of the first complete units of aerial photographers. [I] entered training at Cornell University in the first class and for three months have studied the art of aerial photography, aerial observing and photographic interpretation. The course has been given by English officers, who are expert in this new phase of photography…. The map work and interpretation of the aerial photographs has been taught by French experts and is undoubtedly the most interesting work of any branch of the army. The aerial photographer at the front is expected to get details of enemy works, new trenches, gun emplacements, many of which are invisible to the eye. These photographs must be finished, oriented and all action of value interpreted ready to give to the commanding officer in 20 to 25 minutes after the plane is back to the base, where a lorrie is equipped with dark rooms, etc. I consider it an honor to be in so great a service and that my knowledge and past experience of photography may be used to advantage at this time when every man must give the best in him. Charles Walton Reeves not only came back from war, but he had a long, distinguished career. Among other honors, he became president of the Southeastern Photographers’ Association, and of the National Photographers’ Association. He was also an active member of the Kiwanis and other Atlanta civic organizations. I have a few Reeves original prints, one a quite well-finished portrait on postcard stock of an attractive youth, ca. 1918, in a mat bearing the studio mark you see at the head of this post. 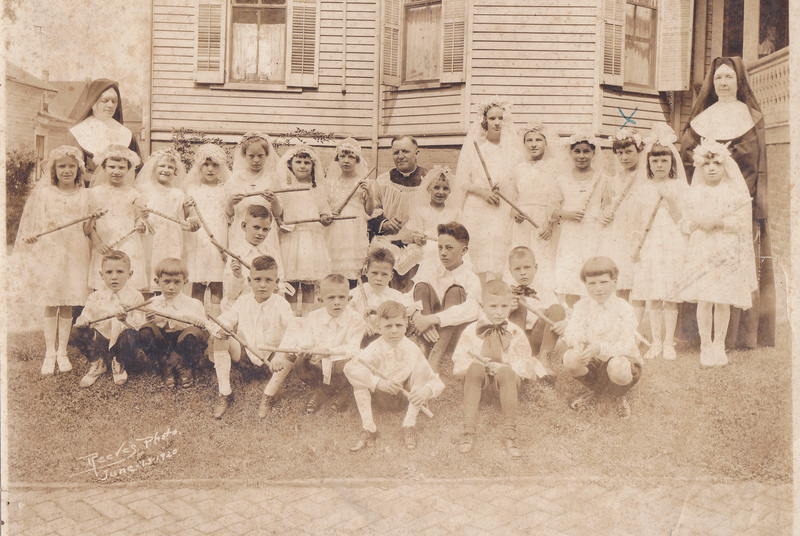 Another from my collection is one of two I believe are confirmation classes at a Catholic school in Atlanta, so it is likely St. Joseph’s school. Both are posed outdoors and the one below is marked Reeves, the other I have is made by Abanaza photographers, and it dates earlier. Ten years later, in 1930, Reeves Studio made another photograph of a group of children, those of the Atlanta Children’s Home, also outdoors, but that photo is beautiful, and far superior to mine. I used that photo in the 1980 Album exhibit which I curated, and I used it in its accompanying catalog (page 50-51). Unless the numbering has been completely redone since then, it is number 3173 in the Atlanta History Center collection. © E. Lee Eltzroth and Hunting & Gathering, 2014. Unauthorized use and/or duplication of this material without written permission from this blog’s author is prohibited. The piece can be re-blogged, and excerpts and links may be used, provided that full and clear credit is given to E. Lee Eltzroth and Hunting & Gathering, with appropriate and specific direction to the original content. sends a shiver down my back. What a wonderful entry and tribute. Thanks for reading, Frances, what you have said is a complement. When what these people do for all of us ceases to “send a shiver,” we will need counseling! Thanks Lee, I’d been interested to see if you’d do a Reeves post. He was also the official photographer of The Salvation Army in Atlanta. We have boxes and boxes of prints and negs. Michael – Thanks for reading! I was going to contact you since I do have a note in the file about photos you folks received in 1998. I did not know there were even more than the collection mentioned in the ’98 newsletter, or that Reeves was considered the SA “Official” photographer! Are any of those digitized? Yes, I should do a full post on the whole family and plan to do more research. C.W. was supposedly born in Cedartown in 1892 which may mean dad (W.R.) was in GA before, or during, his TN stint. How wonderful to hear from you about your grandfather. I interviewed his studio manager in the 1980s (must verify the date) but I never got to talk directly to him. I have information on both your grandfather and your great grandfather and would love to verify facts with you. How fantastic for you to have CWR’s aerial photos! I am so pleased you like the post. Thank you so much for reading it. I know much about C.W. Reeves’ experience as a “Photog” during WWI. As a side note, the term ‘Photog’ was military slang for anyone who was a qualified photographer, like Mr Charles Reeves. I can elaborate much on Reeves’ military experience because I’ve acquired a large grouping of material relating to another 3rd Photo Section member, Owen G. Williams. Williams was a chronicler, bar none. He left us 100’s of photos, documents & a diary, in which Reeves does show up often. Excellent, I will be writing about the whole Reeves and Hearn family of photographers soon. I can also put you In touch with CWR’s family, who will appreciate the information. Thank you for directing me to this post!! You are very welcome! It is still a favorite of mine.